MegaUpload.com, one of the Internet's best-known file-sharing sites, was shuttered by federal officials Thursday. In addition, founder Kim Dotcom (formerly Kim Schmitz) and three other executives connected to the parent company MegaUpload Limited were arrested in New Zealand. The hacker collective Anonymous appeared to respond to the government's action by taking down several high-profile sites with a quickly coordinated distributed-denial-of-service attack, or DDoS attack. As of Thursday afternoon, Anonymous seemed to have shut down the websites for the RIAA, the MPAA, Universal Music Group, and even the U.S. Copyright Office. The timing of the indictment almost certainly fanned the flames of Anonymous’s anger, coming just one day after the group participated in a nationwide protest against the Stop Online Piracy Act (SOPA), which the group had vigorously opposed for months. A 72-page indictment filed in U.S. District Court in Alexandria, Virginia (near Washington, D.C.), charges MegaUpload.com with conspiracy to commit racketeering, copyright infringement, and money laundering, among other charges connected with illegal use of copyrighted materials. The indictment was signed by U.S. Attorney Neil H. MacBride of the Eastern District of Virginia. Some of MegaUpload.com's servers reportedly are in Auburn, Virginia, which is in the Eastern District. A statement from the FBI calls the action "among the largest criminal copyright cases ever brought by the United States and directly targets the misuse of a public content storage and distribution site to commit and facilitate intellectual property crime." The indictment alleges that the criminal enterprise is led by Dotcom and Kim Tim Jim Vestor, 37, a resident of both Hong Kong and New Zealand. Federal statements say that Dotcom founded MegaUpload Limited and is the director and sole shareholder of Vestor Limited, which has served to hold his ownership interests in the Mega-affiliated sites. Bram van der Kolk, aka Bramos, 29, a Dutch citizen and a resident of both the Netherlands and New Zealand, who oversees programming and the underlying network structure for the Mega websites. Dotcom, Batato, Ortmann, and van der Kolk were arrested Thursday in New Zealand. The indictment calls MegaUpload.com "a commercial website and service…that reproduces and distributes copies of popular copyrighted content over the Internet without authorization." The indictment also says that employees and organizations affiliated with MegaUpload were part of a "Mega Conspiracy." The indictment estimates that the infringements cost copyright holders up to $500 million in damages, while the company and its leaders reported incomes of more than $175 million. It also states: "The site claims to have had more than one billion visitors in its history, more than 180,000,000 registered users to date, an average of 350 million daily visits, and to account for approximately four percent of the total traffic on the Internet." According to the indictment, MegaUpload.com, established around 2005, was at one point the 13th-most-visited site on the Internet, and accounted for vast amounts of Internet traffic as users uploaded and downloaded music, movies, books, video games, and computer software. 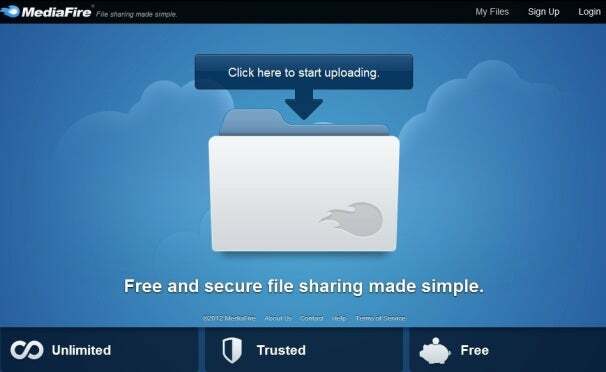 The site was unique among file-sharing sites in that it had the support of several high-profile celebrities (Kanye West and Will.i.am, among others, appeared in a MegaUpload video posted on YouTube). Users have also viewed the site primarily as a way of sending files that are too large to be transmitted by email. The indictment states that the incomes the company’s executives made came primarily from advertising revenues and “premium subscriptions” purchased by heavy users of the MegaUpload service. “In exchange for payment, the Mega Conspiracy provides the fast reproduction and distribution of infringing copies of copyrighted works from its computer servers located around the world,” prosecutors claim. The indictment of MegaUpload Limited cites several movies available for free on MegaUpload.com--ranging from Lord of the Rings: The Fellowship of the Ring to Twilight Saga: Breaking Dawn-Part 1--and gives the location of the servers from which the movies were made publicly available. MegaUpload.com’s indictment comes at a time when Congress is debating stricter copyright infringement laws, in the form of the Stop Online Piracy Act (SOPA) in the House and the Protect IP Act (PIPA) in the Senate. The Associated Press reports that before the site was taken down, MegaUpload.com posted a statement saying that allegations of piracy were "grotesquely overblown." In a hastily assembled retaliation against the federal shutdown of MegaUpload.com, hacktivist group Anonymous has allegedly taken down a number of websites--including those of the U.S. Department of Justice, the Motion Picture Association of America (MPAA), and the Recording Industry Association of America (RIAA). According to DownForEveryoneOrJustMe.com, several websites are out of commission as of this writing, likely thanks to DDoS attacks: the U.S. Department of Justice (doj.gov, justice.gov), the U.S. Copyright Office, Universal Music Group, the RIAA, and the MPAA. At about 2 p.m. on Thursday, @AnonDaily, a Twitter account assumed to be associated with Anonymous, tweeted: "TANGO DOWN! JUSTICE.gov - U.S. Government Website DOWN!" The account has continued to post updates, noting that RIAA, MPAA, Universal Music Group, and U.S. Copyright Office websites were all down, and that Anonymous istrying to knock out several other websites, including the FBI and White House websites. 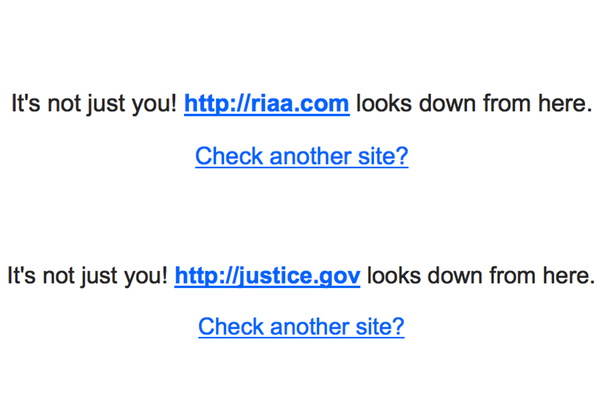 Site status from downforeveryoneorjustme.com for the RIAA and Department of Justice sites. They are also working on taking down the website of MPAA chief, Chris Dodd, who is a strong supporter of the controversial Stop Online Piracy Act (SOPA) and Protect IP Act (PIPA) bills that are currently making their ways through the congressional circuit. Dodd said Tuesday that yesterday's Internet blackout protests performed by big Web players, including Google and Wikipedia, were an "abuse of power."